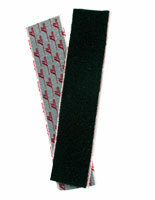 Double-sided boards have both black & grey sides for multiple options. 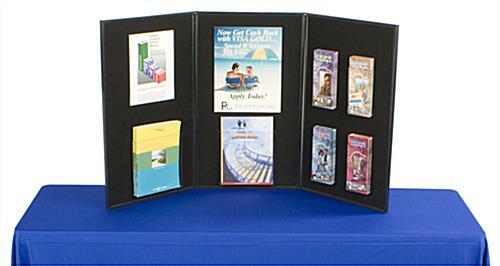 Exhibition display boards fold small to be stored and transported without a problem. 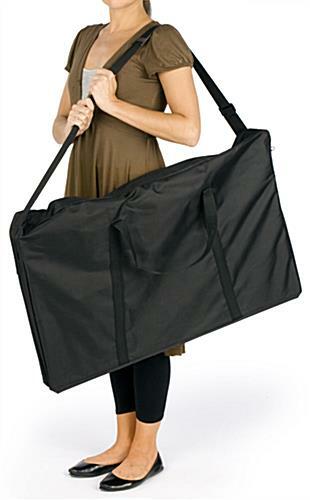 Carrying bag features shoulder strap for portability. Exhibition Display Boards have Black & Grey Sides! These exhibition display boards present a great opportunity to create an eye-catching display. This trade show display leaves an impression, whether on customers visiting your booth, or the company a salesman has just pitched to. 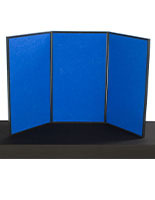 Portable panel displays, folding presentation boards, and other exhibition display boards with (3) panels give you plenty of room to add your own presentation materials. 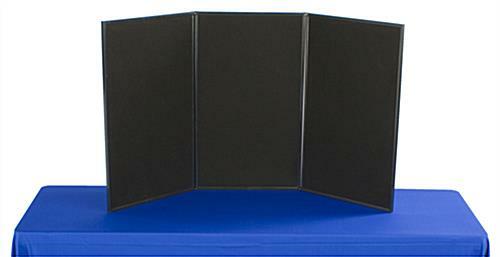 Each individual panel provides 16-3/4" x 28-1/2" of fabric to create your presentation. 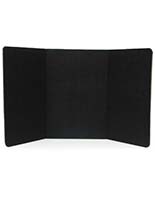 These exhibition display boards utilize hook and loop receptive fabric to provide an easy way to attach various accessories. 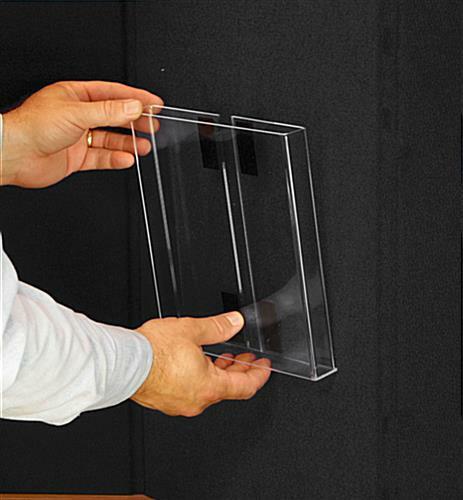 Each of these folding panel displays, exhibition display boards include a carrying bag to transport the trade show displays to and from events. 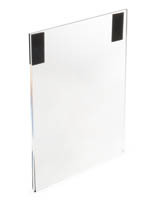 This carrying bag has a shoulder strap to provide a simple way to hold this presentation board. 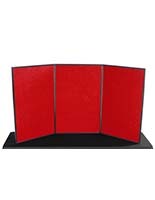 Exhibition display boards feature (2) different-colored sides, allowing one to best coordinate with the event's décor. 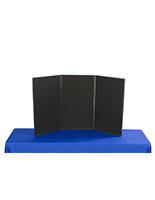 These exhibition display boards fold small for easy transport as well as being able to be stored in more compact areas. 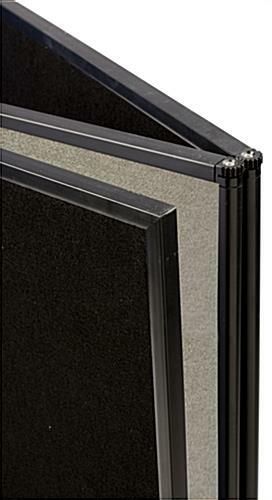 Each panel features hinges at the top and bottom to allow for easy set-ups. 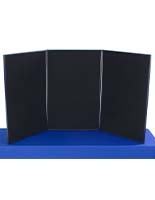 Order exhibition display boards today to make your trade show booth a step above your competitors. 54.0" x 30.0" x 0.75"
18.0" x 30.0" x 2.3"
I purchased this board for a Master Gardener educational program. I was impressed by the quality of the construction and expect it will be durable as well as providing easy updates of the display. The carrying case and portability are important features. Kudos! Thank you so much for the excellent review, Rozanne! We're thrilled to hear that you found our display board to be high-quality and easily portable with the included carrying case, and we know it will be perfect for your Master Gardener educational program. 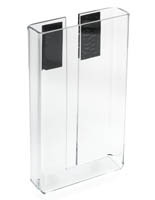 We hope you'll continue to turn to Displays2go for your program's display needs. The student group that I advise uses this trifold as a recruitment tool. They can easily switch out the papers to update information, but you must buy the clear plastic frames with velcro. Overall a sturdy and great board. Thank you for the wonderful review, Tessa! We're delighted to hear that this trifold has become a great recruitment tool for your students. We wish you and your student group the best of luck with your recruitment efforts! I'm very excited to use this display board! It is very lightweight, easy to use and carry, and versatile. Thank you for the great review, Teresa. Our office has ordered this product twice. It is exactly what we need for vendor events to showcase our nonprofit. It is light enough for one person to carry and easy to set-up. We like that it has two different sides. We have found that it does not work well for outside events due to wind but that is hardly the fault of the product. We're so glad to hear we had exactly what you needed, Jessica. Thanks so much for taking the time to leave us a review! We appreciate the recommendation, Joy! We love hearing from happy customers :) Thanks for the kind review!